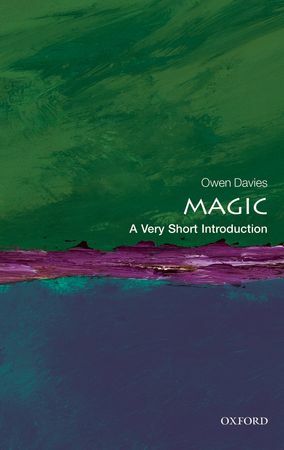 Defining magic is a tough job, but a new book called Magic: A Very Short Introduction by Owen Davies, who previously wrote Grimoires: A History of Magic Books, has a go - and does it rather well, in my opinion. Publisher Oxford University Press says about Magic: A Very Short Introduction on its website: "Magic is a topic of constant fascination and interest which can be described in various ways - supernatural, superstition, simple illusion, religious miracles, and fantasies of the imagination. Over the last century numerous philosophers, anthropologists, historians, and theologians have attempted to pin down its essential meaning, sometimes analysing it in such complex and abstruse depth that it all but loses its sense altogether. For this reason, many people often shy away from providing a detailed definition, assuming it is generally understood as the human control of supernatural forces." Owen Davies doesn't try to provide an overall definition of magic, but explores the many ways in which magic, as an idea and a practise, has been understood and used throughout history. The first few chapters look at how anthropologists, historians and psychologists have studied magical beliefs. Owen Davies then goes on to discuss how it has been done in practise. This starts with written magic - including grimoires - and then looks at those who, in his words, "rolled up their sleeves and did it". As well as examining how magic has been performed and perceived throughout history and in various different cultures, the book ends by considering magic and the modern world. It concludes that magic is part of the human condition and, despite many experts having dismissed a belief in magic as being "primitive", magic will always be with us, in one way or another. Owen Davies is Professor of Social History at the University of Hertfordshire. He has written extensively on the history of magic, witchcraft, and ghosts, including Grimoires: A History of Magic Books and Paganism: A Very Short Introduction.